Today’s print buyer wants the best possible value delivered with their campaign. 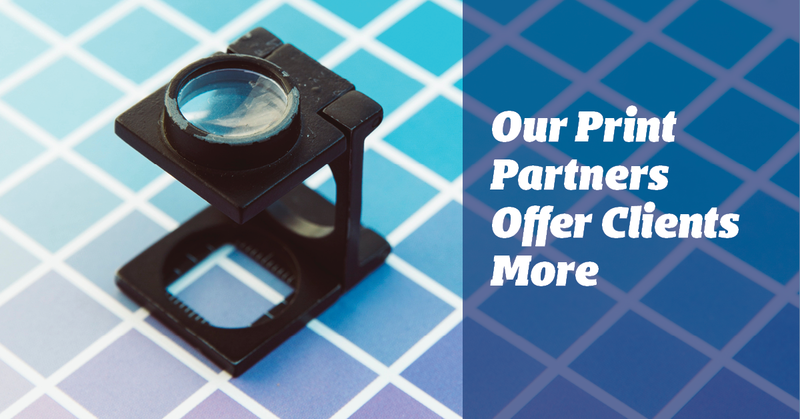 Midwest Direct enhances our print partners with complimentary marketing services, expanded data, and deep dive analytic offerings, outsourced print production and commingled mailing services. Our unique combination empowers print partners to offer increased value to their print clients. Your clients want fully integrated marketing campaigns, but many may be struggling to achieve their marketing goals. While they can release email, and possibly social media posts through their CRM. They need help building campaigns that integrate more channels, such as print or triggered emails, for better results and more relevant insights. With Midwest Direct, you can offer campaigns that integrate any of the following channels with print: email, online display ads, informed delivery, and landing pages. Our white label reporting dashboard allows your clients to see campaign progress – even make some adjustments during the campaign for better outcomes. Ask our integration experts about how we can help you get your clients excited about the power of print when combined with digital. Your clients need help with data from basic mail prep through analytics. To build reporting that creates actionable insights and move your clients to market more, targeting their best audiences for better ROI. We can help with a good data cleanup to correct contacts that have inaccurate emails or out-of-date mailing addresses, as well as identify new segmenting opportunities through data appends. Midwest’s CTRAC Direct division will bring your data up to date. CTRAC focuses on your clients’ data hygiene so you don’t have to. We’ll validate, correct and apply address changes using NCOA software and a blend of in-house techniques perfected over the years. Alongside data hygiene, we are experts in all things data management. We help clarify where your accounts can gain better insight for a stronger return through targeted analytics, persona development, even recommendations for ways to market differently for better results. Variable Data Print (VDP) and personalized mail improve response rates. Ask us how we can help you to your offer your accounts these print capabilities. In a nutshell, VDP is mass-producing customized documents using digital printing technology to create variable messages and images within one print run. Instead of printing the same boilerplate messages, our digital printers can get very specific with individualized messaging and designs, empowering your clients to send a customized mailing to each recipient. Using our revolutionary ColorStream® 3900 digital color printing system. The printer combines advanced inkjet technology and full digital color to enhance the appeal, engagement and business value of transactional and promotional documents. Midwest Direct is known for our commingling services. We have offered commingling services to marketers nationwide for over thirty-five years. We continue to invest and grow our commingling services, and now move over one million pieces of mail per day, including invoices, statements, direct mail marketing, and even voter ballots. To process this high presort mailing volume, we use state-of-the-art mailing and presorting equipment that reads each address, verifies address accuracy, applies an Intelligent Mail® Barcode (IMb) and sorts it all by ZIP code. Commingled mail savings is based on presorting mail to final sort levels; and, destination entry discounts are earned by delivering your mail closer to its final destination. We are experts at high-volume mailings, providing our customers several timely, convenient mail drops. Highly coordinated logistics and superior quality control measures ensure your mailings are sent out efficiently – with a constant eye to cost savings. We can help you track and report important data to your clients – right down to the day their mail arrived in the home. Our clients see significant savings and yours can too when you commingle the mail you print for them. See our full list of capabilities at mw-direct.com. Call at 216.251.2500 or email info@mw-direct.com to schedule a site tour.